First it was revealed that Magna Corp was not the winning bidder in the Chrysler deal (contrary to many reports). The latest slight against the Stronachs (and that Russian billionaire who bought into the company) is the loss of the X3. Specifically, Magna Steyr (who, you may remember, is building the KTM X-Bow) has lost the production contract for the BMW X3 SAV (which is Bayerische-speak for SUV). Now here's my take on all this. Now that Magna has allll this extra production space (though, does anybody buy X3's? You see 5 X5's for every 1 X3 ... but I digress), and since KTM has given them the XBow contract, I predict increased XBow production! I read somewhere that there was a limited number of XBows that could be assembled yearly, due to the production capabilities of Magna Steyr's Austrian facility. Now that we have more space, we can have more XBows! 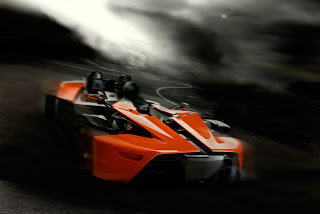 The only downer (for KTM fans, not for Magna) is that the BMW contract extends until 2010 ... so if my predictions prove correct (which they rarely do), you can buy an XBow instead of Olympic tickets ($60,000 = 1 men's hockey ticket). ... I'm not sure how I feel about it. It has a more "pretty" feel (graphically appealing, I suppose), but it seems slightly bigger and bulkier (and I don't mean that in a good way) than the old version. I wrote previously about the '07 NHL entry draft, and named a few individuals whom I found to be interesting, given their BC connections. One of these players, Keaton Ellerby, has been given the opportunity, by NHL.com, to blog about his experiences leading up to the draft. There's only one post up thus far (you can find it here), and I'm not sure if the blog is going to be updated daily, or weekly, or not at all. While not the best written material (he's a hockey player ... cut him some slack), it's definitely an interesting read. I love that the Blogosblogs have given us a way to peer into the minds of individuals who are in situations in which we will never find ourselves. I admit that this post is about 2 days too late, but I felt it was still relevant to comment on last weekend's MotoGP race in China. After an amazing qualifying run, Rossi just didn't have what it took to beat the raw power of the Ducati GP7, ridden by Stoner. The "wonder from down under" finished the race with a solid 3 second lead on Rossi, who just couldn't keep up. Rossi was constantly battling, and gave Stoner an excellent run, but a late-braking mistake with 7 laps remaining caused Rossi to fall significantly back, a loss he could not recoup. John Hopkins performed amazingly in China as well (3rd place), which must make the Rizla Suzuki team happy as pigs in mud (especially when you consider teammate Chris Vermeulen's 7th position finish). The Suzuki team finally seems to be coming into its own, and could be a force to reckon with in subsequent races. The elder Ducati rider, Loris Capirossi ended the race in 6th position, a full 26 seconds back of Stoner. I'm not sure what's up with Capirex this season, but it appears as though his age is finally starting to show. After an exceptional year last season, and the incredible gift of a bike Ducati has presented him with, I definitely pictured him near the top of the point standings at this point in MotoGP season. Also notable in China was the 12th place finish of Honda rider (and current #1 plaque-holder) Nicky Hayden. This is another wretched season that cannot be blamed on the bikes, given the success of Hayden's teammate, Dani Pedrosa. It seems as though "The Kentucky Kid" just can't handle the heat of being #1.